The 33288, manufactured by ATP Electronics, Inc., is an 8 GB microSD flash-memory card. This card is designed for use in harsh conditions often presented by environmental and industrial applications. The card uses single-level cell (SLC) memory, which aids in its ability to operate over wide temperature ranges, consume less power, and provide a reliable data-storage medium through more read-write cycles. The 33288 is an 8 GB SLC microSD card designed for the rugged conditions of industrial and other demanding applications—including solar radiation applications. 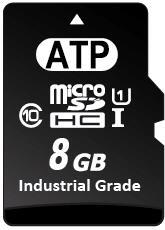 The card has a water and dust ingress protection rating of IP57 (IEC 60529). The 33288 has been subjected to testing for ESD, shock and vibration, salt atmosphere endurance, and bend and torque. The advanced firmware of the 33288 card ensures the integrity of stored data in industrial environments. Two of these features are AutoRefresh and Autoscan. The advanced flash management system of the 33288 ensures device reliability through advanced wear-leveling algorithms and bad-block management. For more information about SLC microSD cards and their benefits, review the FAQ. Our CR6 and CR1000X dataloggers accept microSD cards. What is the difference between the microSD cards that Campbell Scientific sells and the cards that are commonly used in the consumer electronics at home? Campbell Scientific sells, and embeds in their products, microSD cards that have single-level cell (SLC) memory. In contrast, many electronics retailers sell microSD cards that have multi-level cell (MLC) memory. The difference between these two types of memory is significant. The SLC microSD cards from Campbell Scientific are better suited for industrial and environmental applications where wide operating temperatures, low power consumption, and longevity are very important. Most SLC memory cards are designed with industrial applications in mind and, therefore, often have additional perks such as enhanced protection from ESD (electrostatic discharge) and mechanical damage. The MLC microSD cards commonly available at electronics retailers are less expensive, but they are generally not well suited for the majority of applications in which Campbell Scientific data acquisition products are used.